Shanghai Bar is a stylish cocktail bar within the Shard's Hutong restaurant. 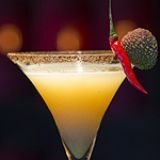 The Shanghai Bar features Chinese wines and cocktails inspired by ingredients used in traditional Chinese medicine. What did you think of Shanghai Bar? While other bars at The Shard rely somewhat on the gobsmacking views, Shanghai Bar at Hutong brings its very own ambience to proceedings, and its opulence nicely mirrors the decadent act of taking a trip to floor 33 for cocktails. You’ll enter out onto floor 32 and will then have to rise up to Hutong, which inhabits a world of its own on The Shard’s 33rd floor. Two dragons greet you at either side of the stairs and the restaurant splits in two directions. Appropriately, to the east is the Shanghai Bar. Tucked in by bamboo and dark wood cut-outs, the small space almost feels like Beijing’s Bird’s Nest stadium in miniature. This is pretty apt, since Hutong aims to recreate the ancient cities of northern China, despite all trappings having been imported direct from Hong Kong, where the flagship Hutong restaurant lives. It is decadence down to the very last detail, with dark wood partitions and curved-back jiaoyi chairs all engraved with golden Chinese symbols. 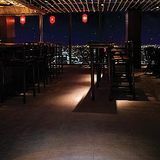 With its bamboo ceiling, apothecary drawers behind the bar and red lanterns descending from above it feels so very authentic, and when all this dark wood and scattered light is met with London’s night time skyline, it makes for a jaw-dropping effect. Just be warned that window seats are scant, so you’ll want to try and reserve ahead. There’s a real buzz of excitement from bar staff about the cocktails they’ve created here, and they’ll make suggestions with so much enthusiasm you almost feel like asking them to pull up a posh seat and join in with the drinking. Punters are much more reserved, nursing a quiet date night cocktail or out for a sophisticated family celebration. Either way, the clientele are classy and seem used to drinking at a height, so you’ll find far less of the smartphone picture-snapping in here than in the other Shard bars where the view is far more accessible. The music is mostly oriental and atmospheric and if it weren’t for Tower Bridge and Canary Wharf blinking back at you, you could well think yourself transported to a glittering Oriental skyline. 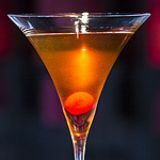 Although drinks are based on a loose concept of Chinese apothecary cures, bar staff very much expect you to be over-indulging rather than looking after your health here. As such, they’ll come up with cocktail recommendations in spades from the ‘cocktail cures’ list. Due to their gentle acidity, all work well as an aperitif should you be booked in at Hutong for dinner. Enthusiastically recommended is a Comfortably Numb cocktail (£12.50), which wakes up the tastebuds with a building heat from Szechuan pepper (good for a cold, according to the drinks list!) and fresh chilli, but balanced out by vanilla Stoli and lychee liqueur. It does what it sets out to do and you’ll feel the tip of your tongue tingling with each sip. The Oriental Breeze (£12.50) is a bit more easygoing, although it’s exotically green and looks almost luminous when under the spotlight at your table. This is thanks to Midori, which is mixed with kiwi, limes and ginger beer for a blissfully tropical flavour, with Don Julio Blanco tequila as its base. Just as bright and presented with a glossy-leafed cape gooseberry, the Chinese Lantern (£14) contains mandarin, and is said to be good for your libido. And it certainly gets you going with a sparkling Champagne finish, and a perfect balance between bitter and sweet due to Aperol, St Germain elderflower liqueur, passion fruit syrup and plum bitters. 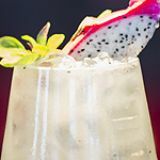 If you’re less inclined to get your evening off to a racy start, the Dragon Pearl (£12.50) is much more subtle and is hugely popular – a striking drink in appearance thanks to the odd looking fruit, but with the addition of Tanqueray gin, ginger and lemongrass cordial, and Thai basil. A few choice classics are also available; Mai Tais and Tommy’s Margaritas more recognisable than the Prohibition-era Last Word (£11.50). This veritable bird’s nest of a bar will have you feeling safely cocooned all the way up on floor 33 of The Shard. Add some bold, oriental flavours to proceedings and you have yourself an authentic slice of northern China in Western Europe’s tallest building. The cocktails may not literally cure what ails you, but those views most certainly will.